We have a number of designs from which you can select. This saves you time and money over creating a custom design. If you want something unique we can do that too. Simply Contact Us for a quote. Your Business Card Guy uses professional grade card stock and you can select the coating all for the same price. 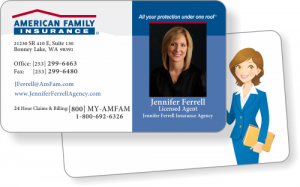 Matte, glossy or a combination will ensure these cards represent your agency well. *Includes FREE shipping to the lower 48 States. Matte, Glossy or Combo are the same price. Don't waste your time with a do-it-yourself ordering system. 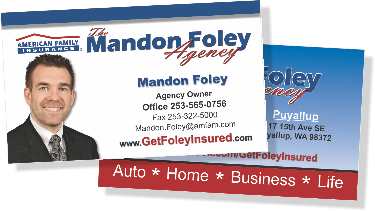 We will put together your business card proof with your info and you can request edits as needed. We might even make design suggestions for you. You will be treated like our business depends upon it, because it does! 1. Pick a template or Contact Us for Custom Design. 3. We'll create a mockup to review. 4. Once you approve it we'll send you an invoice. SKIP THE ORDER FORM AND SIMPLY EMAIL ME DIRECTLY!